Brewer Halogen Exam Lights are dichroic film-coated reflectors filter out 80% of beam heat which results in less tissue drying and increased patient comfort and safety. Flexible, “no drift”, 24" gooseneck offers superior beam alignment which will last a lifetime. 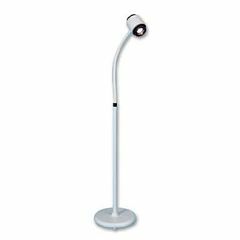 540" rotation of the light head and gooseneck arm allow you to easily position the light source where you need it. Heat sink technology removes bulb socket heat which keeps housing cool. Nonmetallic head eliminates surface heat. High intensity, low voltage, 35-Watt halogen bulb included. 1500 Footcandles @ 24". 3000º Kelvin. Bulb life: 5000 hours: light pattern: 7" @ 24". Internal power cord exits the weighted base at floor level.